Mrs. Niki Cornett, thank you very much! Now I want you to meet Ron Grout, the Operations Manager here on the JOIDES Resolution. I heard he’s the man who plans all of the drilling operations. But I don’t know what that means…..
Ron, can you explain to me and the kids what an operations manager has to do on a drillship? 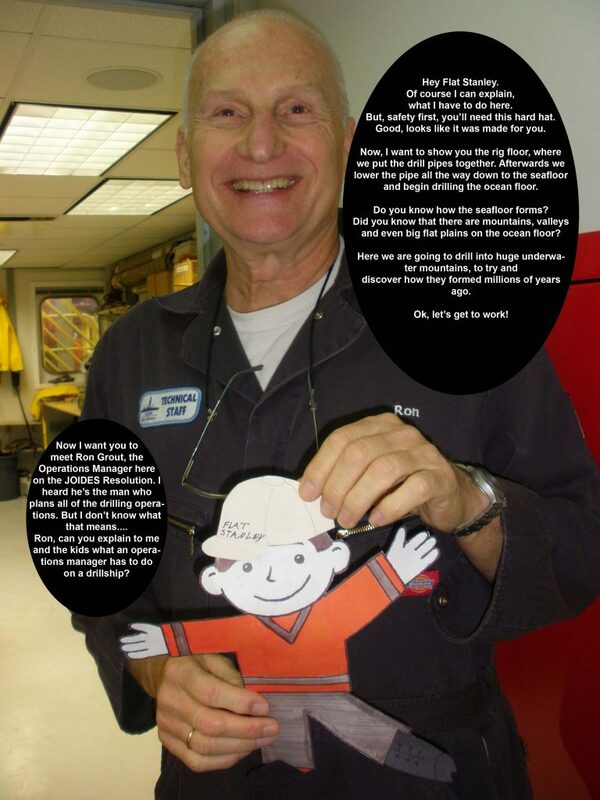 Hey Flat Stanley! Of course I can explain what I have to do here. But safety first, you’ll need this hard hat. Good, looks like it was made for you. Now, I want to show you the rig floor, where we put the drill pipes together. Afterwards we lower the pipe all the way down to the seafloor and begin drilling the ocean floor. Do you know how the seafloor forms? Did you know that there are mountains, valleys, and even big flat plains on the ocean floor? Here we are going to drill into huge underwater mountains, to try and discover how they formed millions of years ago. Ok, let’s get to work!